Shelves for plastic totes allow you to easily organize your storage bins. While you will find online numerous DIY storage shelves or storage tote shelving plans to make your own, we do recommend you also look at end products that do the same thing. At the same time, if you are a bit ambitious and willing to do the effort, you can check DIY tote storage shelves ideas online and do it yourself. This last idea involves a bit more work, but it will provide a good result if you put in the effort. What is a bin storage system? It’s basically shelves with the purpose of accommodating bins of different sizes or shapes. This kind of system must allow you to efficiently store each bin. It must help you clear space rather than clutter things. Whether you need it for your garage, at home or at work, such shelve systems provide optimum storage. If you put in the effort of organizing them properly and mount them correctly, they can literally become a lifesaver. Most storage boxes people have are plastic ones. When you think of shelves for plastic totes, 3 things should come immediately to your mind. The space-saving features or how much space you are clearing with it. Will it handle most of your boxes? Are you clearing enough space for it? Does it provide easy access to your stuff? Loading capacity or how much weight can you put on the storage system. While best practices do say that you must fit heavy things at the bottom and lighter on top, it doesn’t always happen in practice. Can you mount it on a wall? This does not mean you actually mount it to a wall, rather than fixing the system to it. You will find this helps for it not to fall on you. Online you will find different tote storage ideas. We always think the market available products are a good place to start. 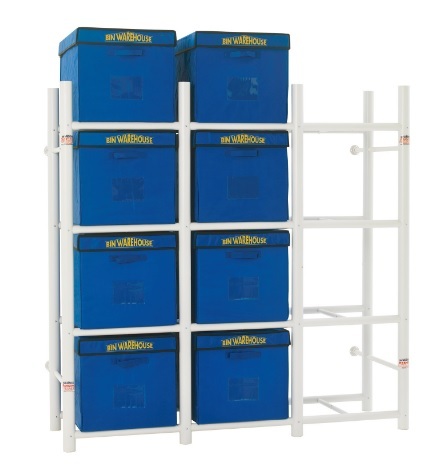 If they match your requirements, these tote shelving units will provide the best value for money. Diy storage bins are also great, but you should only head that route when market products don’t suit your needs. Whether you need extra sturdiness or different shapes, that is the moment to start analyzing custom made shelves. It will hold 8 different storage bins at the same time. The storage system allows for easy in and out of different bins. The estimated weight that it supports is around 800lbs. The metal design makes it ideal for storage spaces and garages. With a white paint finish, it also works well in closets. It can hold up to 18 file boxes or archiving boxes. The sliding solution for the boxes allows you to easily take them out and put them back in again. The storage capacity is around 1000lbs which allows for decent storage capacity. While it will allow for different size standards, we recommend a maximum of 11″ by 13″ and 20″ deep. It is ideal for Law offices, accounting firms, companies or even large archives. As we mentioned earlier, DIY tote storage shelves require more effort on your side. This is beside the actual effort to organize the totes on the shelves. Planning of the tote storage system. This includes the sketch and an actual drawing of the system. It does not have to be a very complex drawing. But the more you go into details, the better the end result will be. Choosing the materials. The materials you use have to be based on what you are trying to achieve. If you need to store heavy things than materials have to be metal all the way. Then comes the question of costs. Better materials cost more money. Execution of the DIY storage bin shelves. This involves knowing your way around building stuff. You need good tools and also experience in using them. The end result depends a lot on what you are doing and how you are doing it. We have other articles on storage ideas around your house or office. Our article on storage boxes with wheels and extendable handle provides good info on how to store heavier things that also need moving.